After a case has been loaded a few times, it will stretch beyond maximum length and must be trimmed. 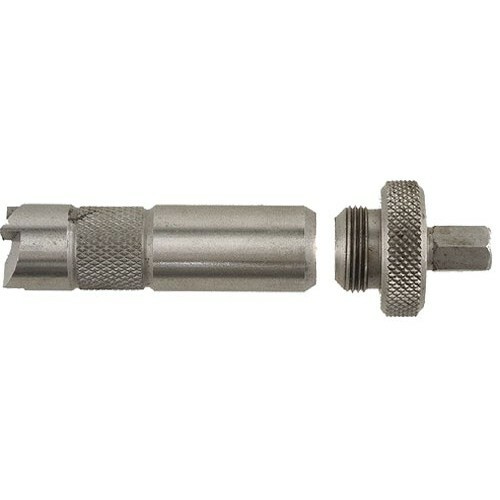 The Cutter and Lock Stud works for all calibers. You will need only one. The Case Length Gauge (Pilot) and Shell Holder must be ordered as Case Length Gauge and shell holder for each calibre. Scroll down for product numbers. Trim cases by hand or electrically. Can be used with an electric drill to trim, chamfer and polish cases faster. Eliminates danger of long cases. Squares the mouth for more accurate bullet seating and exit. Cutter & Lock Stud now available in Large size for .475 and larger calibres.